Noticing bud damage? Could be diamondback moth larvae, or many other possible causes. Regular rains in June and so far in July suggest an inflated risk for sclerotinia stem rot this year, especially in dense stands with good yield potential. Careful when making disease assumptions based on the low disease incidence last year. These plants are deficient in which nutrient? 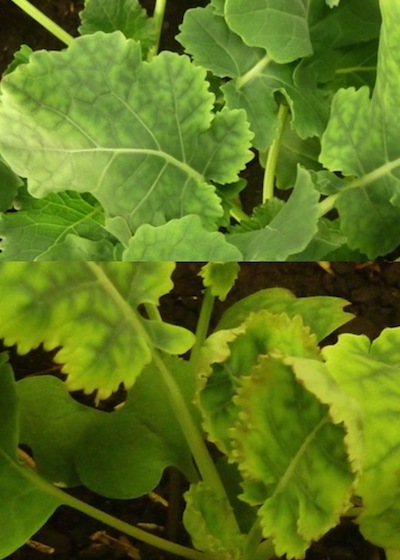 Sclerotinia stem rot: When to split-apply fungicide? Split applications, which are approved for some fungicides, may be worthwhile in some cases. 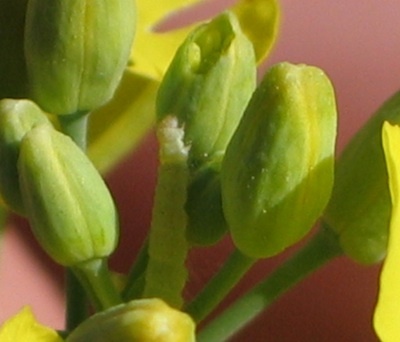 For instance, if the sclerotinia stem rot risk is questionable at early bloom, growers could use a split rate and then wait to see if the second application is needed. Another benefit to the split is if the crop is uneven and the flowering period could be longer than usual. Nitrogen and sulphur top ups at early flower are later than recommended but may pay off if fields are showing obvious signs of deficiency and crop yield potential is high. More than one insect in a crop? If you have lygus bug and cabbage seedpod weevil in the same field and if they are both at 50% or more of their economic spray thresholds, spraying may provide an economic benefit. Insects, heat stress, hail and sulphur deficiency can all cause bud discoloration and damage. Scouting closely for insects may be required to find out which might be the cause, especially if heat stress and hail can be ruled out. Check to see if lygus feeding is preventing crop from coming into flower. Bertha armyworm adults are mounting and larvae will start to hatch later this month. Leafhoppers are at higher than usual numbers in some locations. Before trying any treatment on hail damaged fields, give the crop time to recover. It may recover nicely on its own, likely with later maturity but with a large percentage of its yield potential intact. Or, if the growing points or most of the leaves are stripped off, the plants may not recover sufficiently to warrant further investment in the crop.